CD Projekt RED explains how the scale of Night City differs from The Witcher 3’s world. CD Projekt RED’s Cyberpunk 2077 will be a big game. Even if you didn’t go by past statements made by the developer, its pedigree on The Witcher 3: Wild Hunt is proof of its skill in crafting a dense, memorable world. 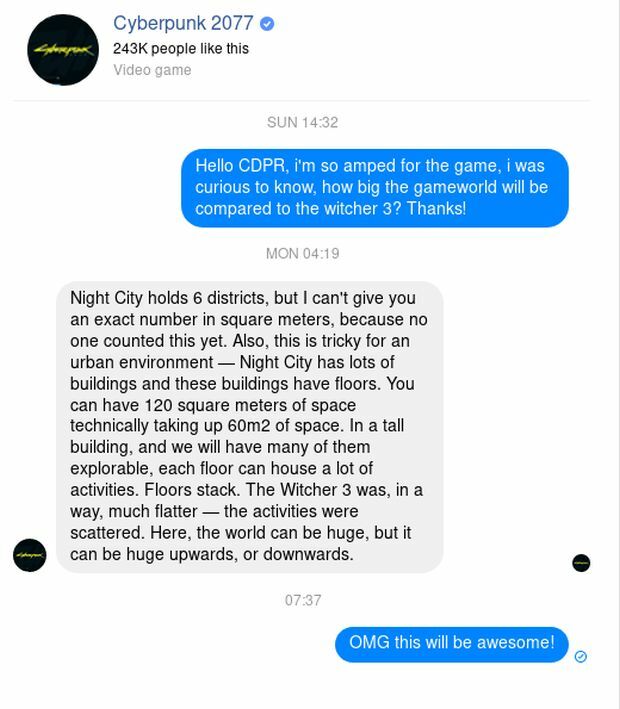 That being said, how big is Night City compared to The Witcher 3? A Reddit user posed this question to the game’s official Facebook page. Though a representative confirmed that there would be six districts in total, the total size in square meters wasn’t yet known (because no one has counted it yet). However, the comparison is difficulty simply because there are lots of buildings with different floors. If there’s a tall building – and there will be many that can be explored – each floor can house “a lot of activities” and stack on top of each other. So while The Witcher 3’s world had a lot of scattered activities due to being “flatter”, Night City can be large both upwards and downwards. Considering how unique each district is and how it all “blends nicely into one consistent and believable city environment,” there should be plenty to keep players busy. Cyberpunk 2077 is currently in development for Xbox One, PS4, and PC. Though it doesn’t have a release date, there are reports of it possibly releasing in 2019.